Prolific American painter and sculptor Ellsworth Kelly, a leader of the hard-edge school, is best known for his huge canvases of geometric forms in bright colors. Kelly got his initial training at the School of the Museum of Fine Arts in Boston (1946-1948), then went on to the Ecole des Beaux-Arts in Paris. He had his first one-man show in Paris in 1951 and continued to live there until 1954, when he returned to New York City. In New York, Kelly exhibited at the Betty Parsons Gallery in 1956, 1957, and 1959. By this time his work had begun to attract wider attention, and he was asked to participate in various group shows, the most important at the Brussels World's Fair (1958) and the Museum of Modern Art (New York, 1959). After 1960 Kelly gained increasing national and international recognition. He was invited to show at the Sao Paulo Biennial in 1961 and at the Seattle World's Fair in 1962. 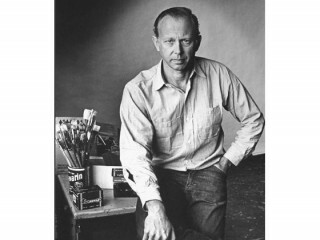 View the full website biography of Ellsworth Kelly.